Former Observatory Director Robert Andress, Jr.
We have received word that Robert Andress, Jr., former director of the Stephens Memorial Observatory, died on May 11, 2015. 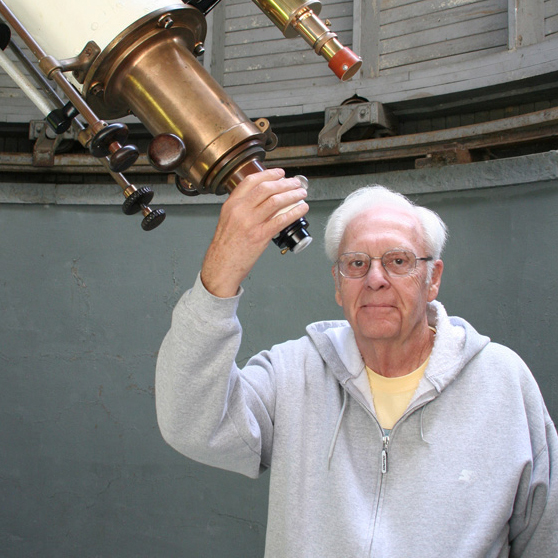 He was a 1953 graduate of Hiram College and active in astronomy for most of his life. Andress touched many lives as he conducted observatory sessions for the public and for college classes for many years. Andress was born in Easton, Penn., on October 14, 1931. He served for 21 months in the U.S. Army. He married Lois in April 1954, and had three daughters, Nancy Lindelof, Barbara Andress and Sally Magargee; as well as 11 grandchildren, and seven great-grandchildren. He taught for 30 years, grades 7-8, high school, and some at Hiram College. Upon retirement, Andress moved from Ohio to Green Valley, Arizona where he was very active in the Sonora Astronomical Society and continued other astronomical pursuits. He reportedly retired as a planetarium director in 2010. We last saw him in Hiram during Alumni Weekend about two years ago when he visited the Observatory for what was to sadly be the last time. Robert Andress, Jr. with an Observatory Visitor During a 1975 Meeting of the Great Lakes Planetarium Association. 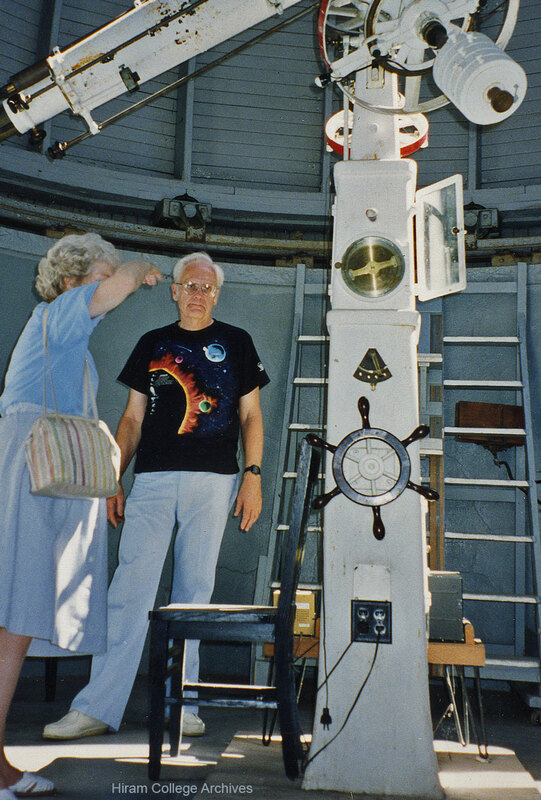 5 responses to Former Observatory Director Robert Andress, Jr.
What a nice tribute. My dad made me love the stars and skies as much as he did. I didn’t do as much in science as he nor do I have his math abilities. We miss him and will always remember our rich summers of seeing planetariums and observatories in the U.S. I live in Florida now with some of the most beautiful skies and many rocket launches. I was able to show him launches many times. He loved them. I was one of his students at Warrensville. For a time during my 10th and 11th grades, I was his assistant, running the planetarium shows and even creating one of them myself as a class project. I was the only student he had one semester! After college I went to Tucson Arizona and became involved in broadcasting, but I always wondered what had happened to Mr. Andress. To think he was not that far from where I was! I knew he had moved to Arizona because of his parents, but had no more info beyond that. I am glad he had such a long and rewarding life. I am honored to have known his. Rest in peace Mr. Andress! I was in grade seven at Brady Middle School (part of the Orange School System) when Mr. Andress really kicked my lifelong interest in astronomy into high gear. He was a teacher at that school and oversaw our after school activities groups. One of which was an astronomy group. I am certain that he guided my parents into providing me with my first real telescope as a Christmas present. It was an Edmund 4-1/4 inch f/10 Palomar Jr. “DeLuxe Space Conqueror”. I still have that scope and several more like it. When I was a Freshman at Orange High School he had me come out to Hiram College as an assistant teacher. He made me do a lot of the teaching! If the skies were clear after classes we would work on variable star estimates using that wonderful Brashear 9-1/2″ refractor. I believe it was in 1968 when our estimates of the minimum brightness of one star in the constellation of Triangulum were published in the IAU news. I still have the old news print out from the Teletype somewhere in my files. The last thing that I knew was that Mr. Andress was conducting guided tours at the MMT Observatory on Mt. Hopkins just south of Tuscon, AZ. I last spoke with him sometime after returning from Iraq in 2006 and then sometime in 2012, roughly. I tried to reach him just before Christmas 2015 and I was told that he was no longer doing tours. No one told me he had passed away. I just found that out now (05-JAN-2016) by doing deeper research. I had wanted to send a new student to visit him since she was going to be interviewing colleges in that area next month. Unfortunately, she will not have that privilege. I will always remember him with great fondness and for the love of the stars and Universe than he helped to firmly root within me. By all means yes. Thank you very much.